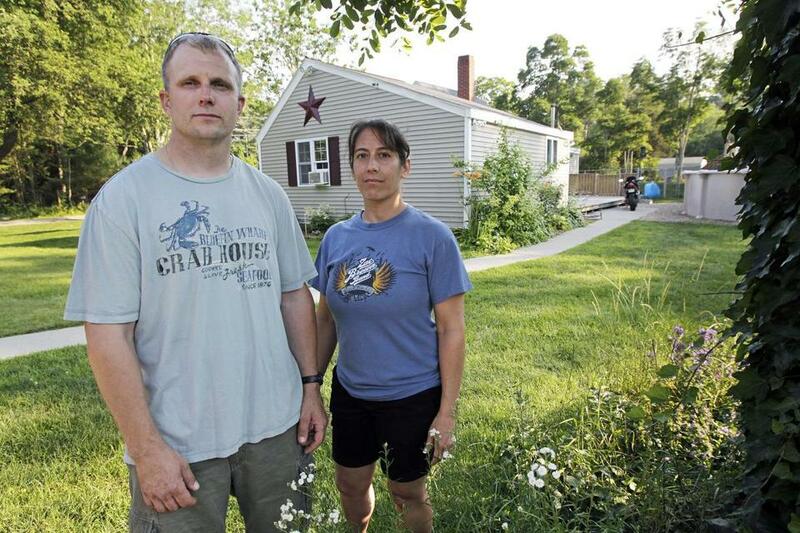 JASON FULLER AND DEBRA HENRIQUES’S house was hit by an alleged drunk driver who was acquitted by a judge. This story was reported by Globe Spotlight Team members Jonathan Saltzman, Marcella Bombardieri, and editor Thomas Farragher. It was written by Saltzman. It’s not clear why Caleb Maddaus drove off into the cranberry country of Plymouth County - a picturesque place of deep woods, stone walls, and faded barns - on a late winter night in 2008. But his arrival in a quiet Middleborough neighborhood was nothing short of spectacular. His Honda Accord struck a house on Spruce Street not once, but three times. He then stumbled from the vehicle, fell face down on the lawn, and had to be carried by police to a waiting cruiser, where he promptly vomited. “No, I can’t drive drunk,’’ the 24-year-old Buzzards Bay resident told a paramedic, in a memorable summary of his sorry state. In the real world of drunken driving enforcement, Maddaus should have been - would have been - in a load of trouble. Read: Police report: Who was behind the wheel? But this was not the real world. It was Plymouth County. He couldn’t have crashed in a safer spot. As the Globe Spotlight Team reported last week, when judges in Massachusetts hear drunken driving cases in bench trials, without a jury, they are overwhelmingly inclined to find defendants not guilty. The statewide acquittal rate exceeds 80 percent, a finding that moved the Supreme Judicial Court to announce Monday it had appointed an investigator to review the pattern of verdicts. If there is an epicenter for that judicial leniency, it is Plymouth County. No county for which data are available holds a greater proportion of bench trials in drunken driving cases. And two judges there have been veritable magnets for savvy defense lawyers, with acquittal rates of more than 90 percent. In the roughly 1,700 Plymouth County trials for operating under the influence from 2005 through 2010, three-quarters of motorists asked judges to render a verdict without a jury, the Globe review found. Judges in bench trials acquitted 86 percent of defendants; juries, a little more than half. That disparity has alarmed and outraged public safety officials, but their complaints to judicial officials have had no effect. “Almost all of the OUIs seemed to be going jury-waived and almost all of those jury-waived OUIs were resulting in acquittals,’’ said John E. Bradley Jr., the deputy first assistant district attorney. But the Spotlight Team’s examination of the cases handled by several judges in Plymouth County - and by especially lenient judges in other sections of the state - shows an almost complete unwillingness to convict, even in cases where the evidence against the defendant is overwhelming. - Judge Thomas S. Barrett presided over the bench trials of at least 210 OUI defendants in Plymouth County between 2005 and 2010, more trials than any judge in the county during that time, according to the DA’s data. He found 12 guilty and 198 of them not guilty - an acquittal rate of 94 percent. - His Plymouth County colleague, Judge Toby S. Mooney, rendered verdicts in at least 181 OUI bench trials during the same time period. She found eight of them guilty, 173 not guilty. That’s a 96 percent acquittal rate. - Judge Mark E. Noonan, sitting in Worcester County, had an impeccable record in bench trials. In 27 OUI trials last year, he ruled “not guilty’’ in all of them, the Globe found. - A similar pattern was found for some judges in other jurisdictions, among them Judge James H. McGuinness Jr. in Middlesex County, who from 2006-2010 has a 96 percent acquittal rate; David T. Donnelly in Suffolk County, who acquitted all 61 OUI defendants in cases the Globe reviewed from 2005-2010; and recently retired Judge Paul F. Healy Jr. of Middlesex, who from 2006-2010, acquitted 92 of 102 OUI defendants in cases examined by the Spotlight Team. Donnelly told the Globe he had reviewed all his OUI cases and stood by his verdicts. The Globe’s analysis is based on data it obtained from district attorneys’ offices through public records requests; it was not always possible to link a verdict with a particular judge. But the Globe hand-checked 1,500 records for 11 judges with high acquittal rates and found the prosecutors’ tally to be 99 percent accurate. Prosecutors and defense lawyers say one reason for the trend toward bench trials - and speedy acquittals - is that judges are under intense pressure to reduce backlogs and resolve cases faster. The state’s trial courts imposed time standards in 2004 after a study found the Massachusetts judiciary to be one of the nation’s slowest. The result? Judges are often all too happy to oblige a request for a bench trial, according to prosecutors, defense lawyers, and even some jurists - a proceeding that often lasts about an hour, a fraction of the time consumed when jurors render a verdict. Connolly, who issued the order to expedite cases in the district courts, told the Globe that dispensing justice quickly is vital to the judiciary. But she said judges are not evaluated on that basis. She offered a different explanation for why Plymouth prosecutors are complaining about bench trial acquittals. Sour grapes. “Dissatisfaction with the results of a case,’’ is how the chief justice put it. When Maddaus’s case was heard in March 2009, 13 months after his arrest, the judge on the bench was Barrett. And right from the start, the former US Naval Air Reserve officer appointed to the bench in 2000 by Governor A. Paul Cellucci seemed to see it Maddaus’s way. The defendant’s lawyer, Jack Diamond, quickly conceded that his client was impaired when his car hit the house owned by a couple who tend a cranberry bog on their thickly wooded 30-acre property. He could hardly have argued otherwise. A Middleborough police officer found Maddaus lying on his stomach in the grass 10 feet from the car. The driver’s door was flung open. The headlights were on, illuminating Spruce Street, the country road where Debra Henriques and Jason Fuller live. The car, after ramming the house three times, was stuck on a raised stone walkway facing the roadway. Maddaus made no secret of his intoxication. “I’m drunk,’’ he told the officer. Slurring his words, Maddaus said he had had six “Jack and Cokes’’ in four hours at a bar in Carver that night - the eve of his 25th birthday. Another judge in a pretrial hearing ordered that statement suppressed without specifying a reason in the court file. But Barrett heard evidence that police had to carry Maddaus - who was not injured - to a cruiser as his rubbery legs dragged behind him. When the police car arrived at the station, he couldn’t stand. After Maddaus lay retching on the floor of a holding cell, the police called an ambulance to take him to the hospital. A nurse later called police to say he was so intoxicated that he might have died without treatment, according to the police report. So if impairment was conceded, what did Diamond, who handles about 100 OUI cases a year and charges $8,500 to defend first-time offenders, ask Barrett to consider? First, that there was no proof Maddaus was driving the Accord, even though Henriques testified she saw only one person inside it, and Maddaus was the only person on the scene. “There’s no evidence that he’s connected to this vehicle in any way, shape, or form other than being lying on the ground 10 feet from the vehicle,’’ Diamond told the judge. Barrett rejected that claim but found another argument compelling. There was no indication, Diamond said, that Maddaus had driven on Spruce Street. To convict someone of operating under the influence of alcohol, Massachusetts, like other states, requires that prosecutors prove three things: the defendant was impaired, he or she was driving the car, and the motorist drove on a public way. Diamond theorized that his client might have somehow gotten into his car on the private dirt path that circles the couple’s cranberry bog. Then, after some drinking, Maddaus could have driven onto a spur of the path and accidentally rammed into their house - all without ever putting tires on a public road. To prosecutor Christopher J. Davidson, Diamond’s theory was preposterous. The car, he said, would have had to come from Spruce to get onto the dirt path in the first place. “There’s no other way it would be coming,’’ he said. Barrett was not convinced. There was no evidence of tire tracks leading from Spruce Street onto the property. The trial was over in 45 minutes. When Fuller learned of the acquittal this past spring, he could not believe it. In a recent interview, Maddaus declined to say whether he drove from Spruce before the crash. He had to fight the charge, he said, because he had a job at the time appraising damage to cars for an insurance company and a conviction could have jeopardized it. “I had a pretty substantial career that was quite dependent on my driver’s license, so it was in my personal interest to have an acquittal,’’ he said. Was justice done? “I’d rather just leave it up to your readers,’’ he said. At least 50 judges, some of whom rotated through the region, held about 1,350 bench trials in Plymouth County’s four district courts from 2005 through 2010, according to statistics gathered by the Spotlight Team. Nearly a third were held by Barrett and Mooney. The fact that the judges who handle most of the bench trials also happen to be the most likely to acquit is no coincidence. He and other defense lawyers said they have no control over which judge presides, but both defense attorneys and prosecutors frequently seek postponements. In some instances, defense lawyers use more than judges’ track records when deciding whether to seek bench trials; some jurists signal in pretrial conferences that the outcome will likely be an acquittal if a trial is held without a jury, according to prosecutors, defense attorneys, and other court officials. The vast majority of the roughly 17,000 OUI cases prosecuted in Massachusetts each year are resolved without a trial. In fact, 85 percent are disposed of before trial - and of those, well over half are “continued without a finding,’’ an outcome that determines neither guilt nor innocence but carries penalties, including loss of license, stiff fines, and mandatory alcohol education. Many defense lawyers and Connolly, the District Court chief justice, contend that the remaining cases go to trial because politically sensitive prosecutors will not drop flawed cases. They say the defendants who seek bench trials do so typically because their cases hinge on legal issues that might be brushed aside by jurors. The Globe - which reviewed thousands of pages of court documents over several months, listened to scores of tape-recorded trials, and attended numerous trials - confirmed that a not guilty verdict was the only reasonable outcome in a number of cases. The government’s case was sometimes hamstrung by slipshod police work, lapses by inexperienced prosecutors, and shaky evidence. But in Plymouth County, where only one in four OUI trials feature a jury, the Globe found case after case in which judges acquitted defendants despite powerful evidence. No judge who hears many OUI cases had a higher acquittal rate than Judge Mooney. A former Bristol County prosecutor who failed the bar exam twice before passing it, Mooney was appointed to the bench by acting Governor Jane Swift in 2002 in spite of reservations about the heft of her credentials raised by a member of the Governor’s Council. Mooney’s reasoning from the bench can be puzzling. Consider the case of a teenager who was involved in a crash in his hometown of Hingham on a late summer night - two doors down from the police station. Just before midnight in June 2009, a Hingham police officer responded to a report that a Ford had just struck a tree and that a male passenger had run off. An officer found a 17-year-old male, the apparent driver, standing next to the driver’s side of the blue vehicle. The teen told police that he was driving around a corner and “lost it’’ and that a passenger, whom he refused to identify, fled. The teenager reeked of alcohol, and his eyes were bloodshot and glassy, police said. The officer found a half-empty bottle of Busch beer on the floor of the Ford. The keys were in his pocket. He refused to perform field sobriety tests but blew a .11 on a breathalyzer at the station, well above the .08 legal limit. Four months later, the youth stood before Mooney and waived his right to a jury trial. He then took the stand and changed his story. Contrary to his admission at the accident scene, he told Mooney that he had not been driving. His friend, the unnamed passenger, had been at the wheel. After the crash, he said, his friend tossed him the car keys and ran. Mooney, however, seemed less interested in the abrupt change in the youth’s story than in the actions of the unidentified friend who melted into the night. “Was your friend drinking?’’ she asked the defendant. “No, he wasn’t,’’ he replied. Mooney was incredulous. The defense lawyer promptly conferred privately with his client. Seconds later, the teenager admitted that he had lied under oath. Yes, he testified, his friend had been drinking, too. At the trial’s end, Mooney accepted the word of a defendant who just moments before had admitted to false testimony. Then, before lecturing the teen about misplaced loyalty, Mooney announced her verdict: Not guilty. Startled and outraged by a torrent of bench trial acquittals in drunken driving cases in Plymouth County, Bradley, the deputy first assistant district attorney, decided to take action five years ago. He began keeping a running tally of verdicts. And he asked a young prosecutor, Davidson, who worked in Wareham District Court, where Barrett and Judge Brian F. Gilligan sat, to send him the files and tape recordings of trials that inexplicably ended in not guilty verdicts. In May 2008, armed with a tally of acquittal rates of judges in bench trials, Bradley and the chief legal counsel to District Attorney Timothy J. Cruz drove to Wareham District Court to meet with Regional Administrative Judge Rosemary B. Minehan. Sitting with Minehan in her office at the meeting was Gilligan, who presided over the fourth most OUI bench trials from 2005 through 2010, according to the data obtained by the Globe, and had an acquittal rate in the high 80s. The meeting lasted about an hour, Bradley said. Gilligan was conciliatory, praising Plymouth prosecutors, but Minehan was defensive, Bradley said. Ultimately, Bradley said, he left the meeting feeling little had been accomplished. Bradley continued keeping statistics, but nothing changed. Minehan told the Globe in an e-mail last week that the prosecutors were simply unhappy with the “win/loss ratio’’ of the office and never suggested improper conduct by judges. She said it would be unethical to urge judges to convict more OUI defendants. Although no county has a higher percentage of OUI bench trials than Plymouth, similar patterns hold in other counties. Bench trials in drunken driving cases are common, and some judges almost never convict. Among them is Judge McGuinness, the Middlesex County jurist with the 96 percent acquittal rate. A former administrative judge on the state Industrial Accident Board, McGuinness was appointed to the bench in 1996 by Governor William F. Weld. From 2006 to late 2010, McGuinness held at least 85 bench trials, and acquitted 82 defendants, according to data obtained by the Globe. A New Hampshire roof installer who was found asleep at the wheel of his car at a Wendy’s drive-through lane was among those pleased to see McGuinness on the bench. A Dracut police sergeant testified that he found Michael Proctor, 24, of Pelham, N.H., around 1:20 a.m. in August 2008 slouched in his Honda Civic about a car length from where customers place orders. At least two other cars were waiting behind his car, which was running. Sergeant Jason George had to yell at Proctor, shine a flashlight in his eyes, and shake him before he woke up, the officer testified. His eyes were bloodshot and glassy, his speech slurred. He smelled of alcohol and was unsteady on his feet. Proctor, who was facing his second charge for OUI, refused to give a breath sample. Six months later, he took the stand in Lowell and testified that he had had at least five beers on an empty stomach. He also conceded telling the arresting officer repeatedly that it was better to sleep in his car than drive around drunk. But Proctor had an explanation for his poor balance: He was taking the antibiotic Amoxicillin for a recently ruptured eardrum and it threw his balance off. “The Amoxicillin didn’t affect your balance on the roof’’ where he worked the day before, said the prosecutor. It was a flat roof, Proctor replied. McGuinness had his clerk read the verdict at the end of the trial and gave no explanation. Not guilty. Fifteen months later, Proctor was arrested for driving under the influence again. That case remains unresolved. 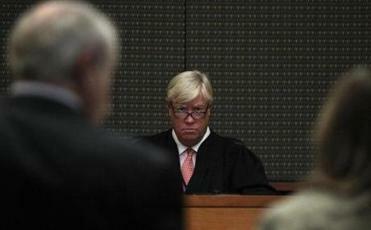 Another Middlesex County judge coveted by defense counsel was Judge Healy in Framingham District Court. A one-time federal prosecutor appointed to the bench in 1987 by Governor Michael S. Dukakis, Healy held at least 102 bench trials from 2005 through 2010, according to the Globe’s review. He acquitted 90 percent of the defendants before retiring in December. They included a 39-year-old house painter from Webster who blamed her erratic driving on fumes from oil-based paints and solvents she said she had inhaled. Janice M. Duffy was arrested for her third OUI by Ashland police around 2:30 p.m. in November 2007 after an off-duty Framingham police officer looked in his rear-view mirror and saw a Dodge Stratus weaving behind his pickup and almost strike his bumper. Duffy was unsteady on her feet, smelled of alcohol, and appeared to be dazed, according to the testimony of two Framingham officers. A bottle of peppermint schnapps was found in her toolbox in the car. Healy ruled that it was too prejudicial to be presented as evidence after Duffy’s lawyer argued police never accused her of drinking from it. Duffy, defended by a court-appointed lawyer because she couldn’t afford to hire counsel, took the stand in her own defense. She testified that she spent about six hours that day painting and sanding, mostly outside but also inside an enclosed porch. After leaving the job at 1 p.m., she went to a farewell lunch for a coworker at a pub. She said she ate a cheeseburger and drank a rum and Coke. David M. Benjamin, a clinical pharmacologist and toxicologist, testified for the defense as an expert witness. His $3,500 bill went to the state because Duffy was indigent. Fumes from paint and solvents, he said, can cause symptoms that mimic alcohol impairment, although the effect is less when breathing fumes outside. The prosecutor did not buy it. Painters, he argued, sometimes simply drink too much after a workday. “It’s not this epidemic of this toxic combination of paint thinner and having a few drinks after work,’’ he said. Healy took a 15-minute recess, then had his clerk read the verdict. Not guilty. The judge offered no explanation. Healy told the Globe recently that he could not remember the specific case, but was “a little surprised’’ that he had acquitted 90 percent of defendants in cases of operating under the influence. “But at the same time, OUI cases generally are totally circumstantial evidence cases, whereas many other offenses, such as assault and battery, usually have direct evidence and direct eyewitnesses,’’ he said in a phone interview. Duffy’s lawyer Donna Paruti said her client’s case was a close one; a jury previously heard the same case and could not reach a verdict. Where some judges offer little or no explanation for their rulings in drunken driving cases, others can be blunt. Taunton District Court Judge Francis L. Marini, the former State House minority leader who was appointed to the bench by acting Governor Swift in 2002, has repeatedly faulted the State Police for failing to videotape OUI defendants while they are being booked. He wants to see whether they look as impaired as troopers described them. In a January 2009 trial, Marini said a 34-year-old Acushnet laborer who was arrested after a trooper allegedly saw him weaving in a Hummer H2 on Route 24 in Raynham probably was under the influence. The trooper had probable cause to pull over the man, the judge said, but guilt beyond a reasonable doubt is a higher standard. And it was unfathomable, Marini said, that the State Police had not videotaped the man in the barracks, especially since a closed-circuit TV camera is trained on newly arrested defendants. Some local police departments across Massachusetts routinely videotape motor vehicle stops and bookings as evidence in drunken driving cases, but not State Police. David Procopio, a State Police spokesman, said that videotapes of motorists stopped on the road or being booked at the barracks would miss many of the subtle signs of impairment that troopers routinely observe. “Someone watching a videotape of a booking process might not realize that the person is impaired because the person is not falling-down drunk,’’ he said. Judges and juries routinely convict people of crimes they never witnessed, Procopio added, and he was puzzled why Marini wanted more evidence for OUIs. “We do hope that Judge Marini has as much concern for the innocent motorists put at risk by drunk drivers every day as he does for the drunk drivers themselves,’’ he said. Prosecutors, police, and anti-drunken-driving advocates say the handling of OUI cases by some judges raises questions about how seriously they do take drunk driving. DISTRICT COURT JUDGE JAMES J. McGOVERN once allowed a defendant who was impaired during a court appearance to drive home. Seldom has that question been placed in higher relief than it was in the courtroom of District Court Judge James J. McGovern, after he let a defendant who was impaired during a court appearance drive home a few years ago. Jorge P. Pinto appeared before McGovern in Taunton District Court in December 2008 for a pretrial hearing on his second OUI offense. In a sidebar conference during the hearing, Bristol Assistant District Attorney Casey Smith and McGovern discussed something startling: Pinto appeared to be under the influence of alcohol at that very moment. Pinto, a 38-year-old Taunton security guard, did look impaired, McGovern agreed. During a break, the judge ordered probation officers to have him blow into a portable breath test machine. Not long afterward, the hearing resumed, and McGovern learned Pinto had blown a .08. “You driving?’’ McGovern asked Pinto. “I drove this morning, yes,’’ he said. And then the judge did nothing. Pinto left the courthouse, got into a Toyota Corolla and drove away, authorities said. The prosecutor frantically followed him in her Chevrolet Corvette and pointed the Toyota out to a state trooper. He pulled Pinto over on Route 44, gave Pinto a series of field sobriety tests, and arrested him. During a search of the car, Trooper Joseph Baker said, he found a bottle of generic Xanax prescribed to Pinto and a three-quarters empty bottle of ginger brandy in a paper bag. At the barracks, Pinto took a breath test and blew a .03, well below the .08 blood-alcohol legal limit. But he told the trooper he had taken two Xanax that day, so Baker called a State Police drug recognition expert to determine whether the combination of anti-anxiety medication and alcohol could have made him legally impaired. When McGovern heard about the arrest that afternoon, he bristled. “You’ve got to be kidding me,’’ he said from the bench, then added, “There’s something foul about it in my humble opinion.’’ In a testy tone, he asked a probation officer why he did not tell Pinto not to drive. The officer said he did not have that authority. McGovern said he was inclined to dismiss the charge. He had his court officer call the State Police three times to bring Pinto in to be arraigned before him that afternoon - even though Baker had not finished his investigation, according to Baker. The prosecutor believed the judge wanted to contain the embarrassing episode, the trooper wrote in his report. McGovern “felt somewhat responsible for having released the defendant despite his obvious state of intoxication and as a result would seek to dismiss the entire case as a way to rectify the situation,’’ Baker wrote, citing the prosecutor’s explanation to the trooper. McGovern’s supervising judge promptly transferred Pinto’s two cases to another judge. Pinto ultimately pleaded guilty to operating under the influence of alcohol in the first arrest and to operating under the influence of drugs in the arrest near the courthouse. The Spotlight Team reported last week that McGovern heard 11 OUI bench trials in Bristol County in 2009-2010 and acquitted all 11 defendants. In a recent e-mail to the Globe, McGovern said he had a “more informed, educated perspective’’ about how criminal defendants experience the criminal justice system because of an “unfortunate matter’’ that happened to him in 1995 - although he said it did not affect how he handles OUI cases. He was referring to this: In December of that year, four years before he became a judge, McGovern was himself charged with operating under the influence. He was arrested in Scituate and refused to give a breath sample, according to Registry of Motor Vehicle records. McGovern was a close friend and former law partner of Michael J. Sullivan, the Plymouth district attorney at the time, whose office was prosecuting the case. So the case was moved to Dedham District Court. McGovern opted for a bench trial. The verdict? Not guilty.